Coming on the heels of Zynga's tie-up with Lady Gaga, Electronic Arts has partnered up with world-renowned chef and host of ABC television show “Jamie Oliver’s Food Revolution,” Jamie Oliver for the Facebook game, Restaurant City. The move signals an increasing trend, whereby social game makers are using virtual items to influence specific behaviors on behalf of major corporate sponsors. Restaurant City enables players to design and manage their own eateries, create appetizing menus and employ their Facebook friends as waiters and chefs. The relationship will enable Restaurant City’s nearly six million monthly players fun ways to engage with Jamie Oliver’s co-branded virtual items available within the game. 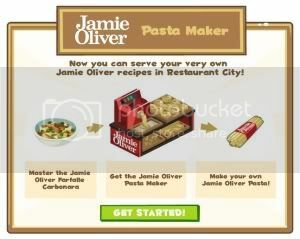 For four consecutive weeks Restaurant City will feature a recipe of the week from Jamie Oliver and be asked to acquire ingredients in return for an exclusive collectable in-game item, the Jamie Oliver Pasta Maker. Once players have successfully created each dish in Restaurant City, they’ll receive a link to the real recipe from Jamie Oliver’s web site instructing them on how to recreate the dish in real life. Oliver’s relationship with Restaurant City marks the first time a celebrity chef has partnered with a social game. According to AllFacebook.com, the Restaurant City application has over 5,000,000 monthly active users (MAU's).